Frank Darabont did an amazing job of bringing Stephen King’s Shawshank Redemption to the big screen, and goes the horror route with this one. But, beneath the horror lies a study in human nature and how mass hysteria can lead to even more chaos and destruction. 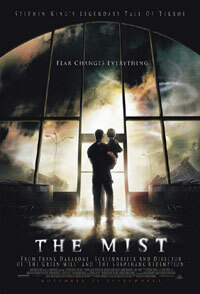 In a typical Stephen King lakeside Maine town, a man and his boy get trapped in a shopping centre with a wide variety of townsfolk when a strange mist rolls in, bringing with it untold horrors. Inexplicably creepy creatures flourish in this mist. The various factions within the store include our hero and a pool of rational people, as well as morons, military men and a religious nut quickly sweeping up those stricken with fear, leading to serious tension and the danger of violence and death. Amid this, plans have to be made to escape, and if so, how the unpredictable beasts and insect-like freaks can be fought – which location is worse, inside or out? With an equal share of scares and some silly moments, The Mist packs enough tension and action for some thrilling viewing, and the ending is no sell-out.